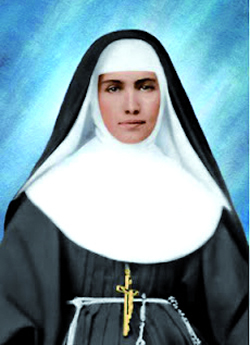 On October 21st 2012 Blessed Mother Marianne Cope – a religious nursing sister from Syracuse NY, USA will be canonised in Rome by Pope Benedict XVI. She was born in Germany in 1838 but her parents emigrated to America when she was still a young girl. She entered the congregation of the Sisters of the Third Order of St Francis where she was found to be an exceptionally efficient hospital administrator and nursing director – a natural leader who was elected to several important positions within her congregation. In 1883 she volunteered to go out with a group of her sisters to work in Hawaii in response to an appeal for help from Father Damien. She wrote “I hope the Fr Provincial’s good heart will approve my wish to accept the work with leprosy patients in Hawaii in the name of the great Saint Francis.” After some confusion (the local Hawaiian bishop and government officials did not want her to go to Molokai itself) she helped organise a hospital in Honolulu, finally arriving at the leprosy settlement on Molokai in 1888. Fortunately, she did manage to be with Father Damien before he died. She was present at his death and reassured him that she would look after his patients on the island. She then proceeded to work in the leprosy settlement Kalaupapa, on Molokai for the next thirty years – without a break or leave! She became famous for normalizing the life of her patients, bringing in colour, aesthetics and order to their chaotic lives. She said in 1889: “My heart bled for the children and I was anxious and hungry to help put a little more sunshine into their dreary lives.” She died on 9 August 1918. She was a person of amazing energy, a great organizer, an efficient and compassionate nurse, a perfect mother to the nursing sisters and children in the settlement and above all else a holy woman of great depth and active spirituality. She derived strength for her work from her Franciscan roots and like St Francis saw Christ in the needy patients and children she cared for. She would say: “The charity of the good knows no creed and is confined to no one place” – an excellent motto for St Francis Leprosy Guild. Now, both she and Father Damien will be Saints. Her feast will be celebrated on 23 January.